If you're Facebook addicted and using Facebook Chat feature as your primary chatting tool than you're must aware of some of its conflict issues like you can't hide your offline friends, you can't disable the chat sidebar panel, you can't only display users who are online, you can't check friends profile while chatting etc. etc. and if you're not satisfied and need more features and more control over your Facebook Chat feature than you can do it by installing a Web Browser Plug-In named "ReFaceChat" which provides you total control over your Facebook Chat.
" is a browser Plug-In for Facebook Chat available for Mozilla's Firefox, Google's Chrome, Microsoft's Internet Explorer and Apple's Safari and it contains all the feature which provides you a feel of fully loaded Facebook Chat Messenger. ReFaceChat has following built-in features. 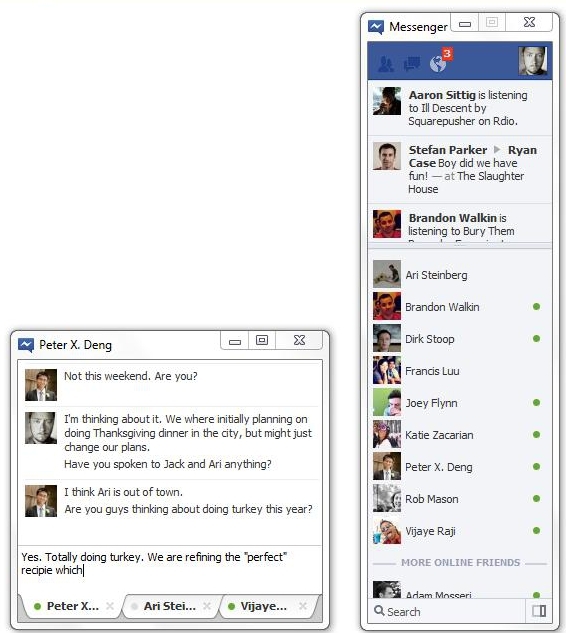 Ability to Disable Facebook Chat Sidebar. Pop-up Notification when friends get connected. Create Chat Group according to Friends List. Linking to friend's profiles within the conversations. Only Display Friends who are Online. Speed of reloading Facebook Chat. Create your own Online and Offline List. Click here to Download and Install ReFaceChat Plug-In for Facebook Chat and enjoy chat with your own customization.